Sole proprietorship form of business is the most common form of business that is owned by many persons across India. 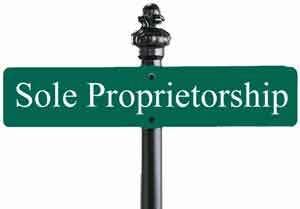 A business which is owned, operated and managed by a single individual is called sole proprietorship business. In India sole proprietorship form of business does not have any legal identity. It’s represented by the person who owns it. If any liability or any legal actions need to be taken on business then it will be taken on the owner of business not the business itself. The owner is the only person who can take decisions. In India we do not have any place where the sole proprietorship businesses are to be registered. Registration is required only if you requires certain approval from certain authority to run the business. While deciding name of the sole proprietorship business you need to take trade mark and other copyright issues in to account. Under “know your customer” requirements of bank, you need to provide two certificates to open your bank account. Under the state act for shop and establishment you need to send an application within the specified time as applicable to the state for registration. After getting accepted you will be issued a certificate on that. If your are rendering services which is taxable as per service tax provisions and during the year your turnover exceeded or likely to be exceed Rs. 9, 00,000 then you should register yourself with the service tax authorities. But it does not mean that you cannot register with service tax or charge service tax to clients if your turnover is less than Rs. 9, 00,000. You can voluntarily register yourself and pay service tax accordingly. If you are buying or selling goods from other states then VAT registration will be required. Similarly if you are buying and selling goods within the state then state sales tax will be applicable and you need to get yourself register for it. You need not file a separate application for your pan card if you as an owner of the business already have a pan card. While filling income tax return, you need to calculate profit and loss in your name and file the income tax return accordingly. TAN is not required if your proprietorship business’s turnover does not exceed Rs. 1 crore. If you have a proprietorship business which is rendering professional services then you need not apply for TAN if it’s not crossing the limit of Rs. 25 lakh. TAN is applicable to those persons who are liable to deduct income tax for certain payments. For above mentioned business or profession these TDS provisions are not applicable. You can register your business under provident fund act if you have 20 or more employees in business. You have to get yourself registered at the register office of employee provident fund. After registration with EPFO you can open PF accounts in the name of your employees and start contributing to it. Registration will not cost you anything but if you are doing it through a professional then you need to pay professional charges. ESI registration will be mandatory if you are employing more than 10 employees in factory or 20 employees in other establishment not being a factory. Registration will not cost you anything but if you are doing it through a professional then you need to pay professional charges.